Here is some helpful information for common struggles among college students. Please note that this information is meant to educate and help with less serious situations. Although you might feel alone in your struggle against depressive moods, the reality is that many people experience these moods from time to time, or even regularly. In fact, it is estimated that 1 in every 4 persons experience significantly depressed mood at some time in their life. Depression can affect any kind of person at any stage of their life. You may be an introvert or an extrovert, socially active or shy, youthful or elderly, male or female, wealthy or poor. Whatever your distinction, you can become depressed. That means that any person you know is fair game. So remember, you are not alone. This information on depression was taken from The Center for Clinical Interventions handouts. Build structure into your day. Set daily goals and stick to them. Build pleasure and fun into each day. Treat yourself to something that you will enjoy and that will require you to expend some energy. Keep active—exercise, swim, jog, play tennis, etc. You choose the activity. Get plenty of rest and sleep, but do not overdo it. About 7-8 hours should be enough. Eat balanced nutritious meals. As always, cut down on the junk foods. Allow yourself to experience your feelings. If you need to cry, do so. If you are angry, find a safe way to express that anger. Acknowledge the feelings, and experience them a little at a time. Keep a journal; write out how you are feeling and what you are thinking. It’s a nice way to experience the feeling as opposed to keeping them inside. Develop a support system of positive people—good friends, family, a counselor—or anyone who will be supportive, encouraging and uplifting. Give yourself time to feel better. Change doesn't really happen overnight. There will be highs and lows, but allow yourself the time you need. Seek out professional help if you feel the need of, or want additional help in, working through your feelings. 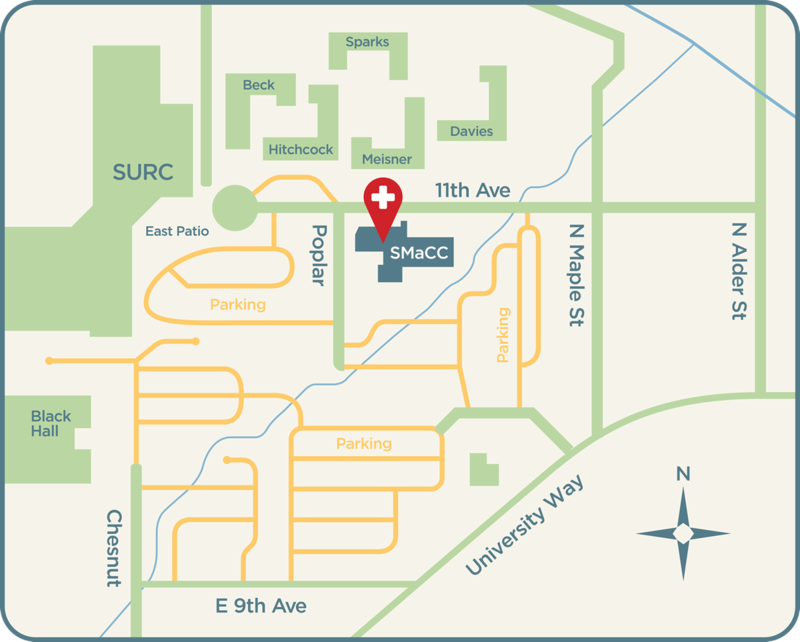 The CWU's Medical & Counseling Clinic is here to help! Call 509-963-1391 to make an appointment. Seasonal Affective Disorder (SAD) is a cyclical type of depression usually experienced in fall and winter months, and is brought on by insufficient light. As the days shorten and become cloudier in fall and winter, many people experience an increase in SAD symptoms. What is the difference between Seasonal Affective Disorder (SAD) and the “winter blues”? The winter blues can usually be helped with increased physical activity and increased amounts of light in the living and work environment. SAD sufferers may need more intensive treatment, specifically anti-depressant therapy and light therapy. Get as much light as possible and avoid dark environments during daylight hours in winter. Allow natural light to shine through open doors and windows when temperatures are moderate. Try painting walls with lighter colors, installing brighter light bulbs, removing heavy drapes, and check into skylights. Exercise daily, preferably outdoors, to take advantage of natural light. If you must exercise indoors, do it preferably in bright, natural sunlight or in bright light environments. Try sitting in front of sunlight from a south-facing window for short, but frequent periods during the day. Take sunlight breaks as much as you can. Rearrange work spaces at home and work to be near a window, or set up bright lights in your work area. Stay at regular sleep/wake cycle. People with SAD who get up every morning and go to sleep at the same time report being more alert and less fatigued, than when they vary their schedules. Arrange outings and social occasions for day times and early evenings in winter. Avoid staying up late, which disrupts the sleep schedule and biological clock. Try putting lights on a timer in the bedroom or use a dawn simulator; set a timer switch to ½ hour before awakening. Some people with SAD report that this light technique has an anti-depressant effect and helps them awaken more easily. When possible, postpone making major life changes until spring or summer. Feeling afraid is very much a part of the experience of being human. Fear is actually a survival instinct when it occurs in response to a realistically dangerous situation. Think about how you might react if a dangerous animal approached you. Most likely you would respond with fear. In fact, it is often helpful to respond with fear at times like this because when we become afraid, our body goes through a whole series of changes that ultimately serve to protect us. This fear response would probably lead us to either run for our lives or become sufficiently ‘pumped up’ to physically defend ourselves. As you see from this example, the experience of fear is part of the process of survival. Anxiety can also be experienced in less threatening situations. For example, athletes before a big game or race will feel some degree of anxiety. This is a good thing, as some anxiety in this situation will pump them up and get them ready to compete. Anxiety only becomes a problem when it is out of proportion to the situation, that is, when it often occurs in situations where there is no actual threat or danger. Some anxiety might be anticipated in certain situations (e.g., a job interview, making sales pitch), but if the anxiety is so extreme that is stops you from doing what needs to done, then it becomes a problem. When anxiety occurs at this extreme level, it interferes with quality of life. Everyone knows that breathing is an essential part of life, but did you know that breathing plays an essential role in anxiety? Breathing is a powerful determinant of physical state. When our breathing rate becomes elevated, a number of physiological changes begin to occur. Perhaps you’ve noticed this yourself when you’ve had a fright; you might suddenly gasp, feel a little breathless and a little light-headed, as well as feeling some tingling sensations around your body. Believe it or not, the way we breathe is a major factor in producing these and other sensations that are noticeable when we are anxious. While over breathing and hyperventilation are not specifically dangerous (it’s even used in medical testing! ), continued over breathing can leave you feeling exhausted or “on edge” so that you’re more likely to respond to stressful situations with intense anxiety or panic. Gaining control over your breathing involves both slowing your rate of breathing and changing your breathing style. Use the calming technique by following these steps and you’ll be on your way to developing a better breathing habit. 1. Ensure that you are sitting on a comfortable chair or lying on a bed. 2. Take a breath in for 4 seconds (through the nose if possible). 3. Hold the breath for 2 seconds. 4. Release the breath taking 6 seconds (through the nose if possible), then pause slightly before breathing in again. o When you first begin changing your breathing it may be difficult to slow your breathing down to this rate. You may wish to try using a 3-in, 1-hold, 4-out breathing rate to start off with. o When you are doing your breathing exercises, make sure that you are using a stomach breathing style rather than a chest breathing style. You can check this by placing one hand on your stomach and one hand on your chest. The hand on your stomach should rise when you breath in. Try to practice at least once or twice a day at a time when you can relax, relatively free from distraction. This will help to develop a more relaxed breathing habit. The key to progress really is practice, so try to set aside some time each day. Information on anxiety was taken from The Center for Clinical Interventions handouts. Anger is a normal human emotion, and can range from mild irritation to an intense range or fury. Some of these situations you may be able to avoid, such as planning ahead to avoid running late. Other situations are less in your control, such as being cut off in traffic, but what you can control is your response. When you notice these warning sign, stop and ask yourself what it is that is making you angry. Often there will be something going on that is quite reasonable to feel angry about, so allow yourself to acknowledge this. But it is also important to be clear about the cause of anger so that we don’t respond in a way that is out of proportion. (eg. staying angry all day about someone else using up the last of the milk) or take out the anger on the wrong person (eg. Getting angry at family members when it is your boss you are angry with). 1. Time Out: This simply means removing yourself from the situation for a period of time, to give yourself a chance to ‘cool down’ and think things through before you act. For example, when you notice yourself becoming angry during an argument with your partner, say “I need to take time out, let’s talk about this calmly when I get back” and then go for a walk. 2. Distraction: If you cannot change the situation, it can help to distract yourself from whatever is making you angry by counting to ten, listening to music, calling a friend to chat about something else, or doing housework. For example, if you are stuck in traffic and getting angry, out on the radio and try to find a song you like, or count the number of times the chorus is sung. 3. Silly Humor: While it is not always possible to just ‘laugh your problems away’ you can often use humor to help you to take a step back from your anger. For example, if you are angry with a colleague and refer to them as ‘a stupid clown,’ think about what this means literally. Imagine or draw them dressed in a clown suit, with big shoes and a red nose. If you picture this image every time they do something which bothers you, it will be much easier to keep things in perspective. 4. Relaxation: Just as our bodies are strongly affected by our emotions, we can also influence our emotional state without physical state. Relaxation techniques, such as taking slow deep breaths or progressively tensing and relaxing each of your muscle groups, can help to reduce anger. Information on anger was taken from The Center for Clinical Interventions handouts. FACT Although the majority of people with an eating disorder are female, the numbers of males are increasing significantly. MYTH Bulimia is a good way to lose weight—to have your cake and eat it too. FACT Bulimia is a poor weight reduction method. First, it doesn’t work (as was concluded in a London study of 500 bulimics where a weight gain of 7-10 pounds occurred for each) and secondly, it is very dangerous and created an altered biochemical state predisposing one to numerous physiological and psychological problems. MYTH Bulimia is only true of those who consume huge amounts of calories (1,000-30,000) in one sitting and then throw up immediately afterward. FACT Bulimia is a word used to describe people whose eating is out of control. A binge may be as small as several cookies or as large as three bags of groceries. People who are bulimic think about food, feel guilty about it, binge, then think about how to get rid of the food/weight—any number of methods are used…purging through vomiting or the use of laxatives and/or diuretics, exercise, sleeping it off, and/or fasting for the next several hours or days. MYTH Compulsive overeating is not as serious a problem as anorexia or bulimia. (In fact, most obese people are jolly). FACT Those who are compulsive overeaters have an equally difficult struggle with their life and suffer from numerous physical problems and emotional strain. Heart disease, high blood pressure, diabetes and depression are only a few of the potential consequences of compulsive overeating. MYTH If you have an eating disorder you will always have an eating disorder—it will be a lifetime struggle and process of recovery. FACT Although many persons who seek treatment for their eating disorder still think about food and losing weight, these same persons can achieve a new perspective on life which allows them to live life fully—without being obsessed and driven by their thoughts and feelings. People with eating disorders often have very negative views of their bodies & physical appearance. This can have a significant impact on their quality of life. It can also serve to keep their eating disorder going. It is difficult for people to change their actual body shape and appearance. People may lose weight in the short-term, but will be vulnerable to a range of consequences when their weight is below the healthy point for them- increased preoccupation with food, binge eating & reduced metabolism are just some examples. There are also aspects of appearance that are almost impossible to change. Frame size & height are genetically determined & (outside of surgery) unable to be altered. All of this can be very frustrating for people who dislike their appearance. Fortunately, although actual appearance is hard to alter, body image can be changed. If you think back to the definition about, it is how an individual feels about their body that is important. Perhaps you can think of two friends who have similar overall appearances, yet one is satisfied with how they look & one is not. The difference is not in their bodies – it is in how they view them & how much importance they place on their appearance & weight. Consider the factors that have influenced your body image. How did your body perceptions & thoughts develop? Have they changed over time? What would help you to start creating a positive image now? Consider what you do like about your body. Try scrutinizing yourself for things that you like rather than for flaws. You may also like to consider the things your body does (walk, swim, dance…) that you enjoy or are grateful for. Stop body comparisons! Do you compare your body to others? Most people report feelings worse about themselves after doing this. Have a go at stopping altogether, or least cutting down. Expand you areas of interest. One consequence of being very concerned about weight & appearance is that other interest or hobbies may be neglected. Try to think of some new things to try, or some old interests to return to. Are there skills you’d like to learn? Groups you’d like to join? Evaluate your body-related thoughts as if you were a scientist or lawyer. When you say, “I look fat & ugly,” do you have factual evidence to support this? Would others describe you the same way? Have you received positive comments about your looks? Separate ‘real’ emotions from ‘feeling fat’. If you often say (or think) “I feel fat”, consider what you mean by this. Remember that “fat” is not an emotion! Often individuals with an eating disorder will say “I feel fat” when they experience emotions like anxiety, guilt, or loneliness. Label feelings using emotion words & shift the focus away from weight. Keep at it. You didn’t develop a negative body image overnight & it won’t disappear overnight either. Try not to give up too soon. One of the body’s reactions to fear and anxiety is muscle tension. This can result in feeling “tense”, or can lead to muscles aches and pains, as well as leaving some people feeling exhausted. Think about how you respond to anxiety. Do you “tense up” when you’re feeling anxious? Muscle relaxation can be particularly helpful in cases where anxiety is especially associated to muscle tension. This information sheet will guide you through a common form of relaxation designed to reduce muscle tension. Muscle tension is commonly associated with stress, anxiety and fear as part of a process that helps our bodies prepare for potentially dangerous situations. Even though some of those situations may not actually be dangerous, our bodies respond in the same way. Sometimes we don’t even notice how our muscles become tense, but perhaps you clench your teeth slightly so your jaw feels tight, or maybe your shoulders become. Muscle tensions can also be associated with backaches and tension headaches. One method of reducing muscle tension that people have found helpful is through a technique called Progressive Muscle Relaxation (PMR). In PMR exercise, you tense up particular muscles and then relax them, and then you practice this technique consistently. Once you’ve set aside the time and place for relaxation, slow down your breathing and give yourself permission to relax. When you are ready to begin, tense the muscle group described. Make sure you can feel the tension, but not so much that you feel a great deal of pain. Keep the muscle tensed for approximately 5 seconds. Relax the muscles and keep it relaxed for approximately 10 seconds. It may be helpful to say something like “relax” as you relax the muscle. When you have finished the relaxation procedure, remain seated for a few moments allowing yourself to become alert. Right hand and forearm: Make a fist with right hand. Right upper arm: Bring your right forearm up to your shoulder to “make a muscle”. Forehead: Raise your eyebrows as high as they will go, as though you surprised by something. Eyes and cheeks: Squeeze your eyes tight shut. Mouth and jaw: Open your mouth as wide as you can, as you might when you are yawning. Neck: Be careful as you tense these muscles. Face forward and then pull you head back slowly, as though you are looking up at the ceiling. Shoulders: Tense the muscles in your shoulders as you bring your should up towards your ears. Shoulder blades/back: Push your shoulder blades back, trying to almost touch them together, so that your chest is pushed forward. Chest and stomach: Breathe in deeply, filing up your lungs and chest with air. Hips and buttocks: Squeeze your buttocks muscles. Right upper leg: Tight your right thigh. Right lower leg: Do this slowly and carefully to avoid cramps. Pull your toes towards you to stretch the calf muscle. Right foot: Curl your toes downward. Information on progressive muscle relaxation was taken from The Center for Clinical Interventions handouts. While breathing is a function most people take for granted, rarely is it practiced in a proper fashion. Lie down on a rug or blanket on the floor with your legs straight and slightly apart, your toes pointed comfortable outwards, arms at yours sides not touching your body, your palms up, and your eyes closed. It is best to breathe through your nose, as the tiny hairs and mucous membranes filter out dust and toxins from the inhaled air. Keep your mouth closed as you breathe. As you breathe, your chest and abdomen should move together. If only your chest seems to rise and fall, your breathing is shallow and you are not making good use of the lower part of your lungs. As you inhale you should feel your abdomen rising; it is as it your stomach is filing with air. As you exhale, the abdomen comes back in, like a balloon releasing all of its air. The chest and abdomen should rise as you inhale and fall as you exhale. The chest should move only slightly. Have a good night’s sleep and take short breaks throughout the day. Practice relaxation, meditation, or yoga. Maintain healthy eating habits and diet. Avoid stimulants. Practice your religious and spiritual needs. Prioritize your tasks into “essential”, “important”, and “trivial”. Set realistic goals – balance work with recreation, exercise, and relaxation. Break huge tasks into smaller ones. Organize your time and environment to fit your preference. Allow for some flexibility in your time schedule. Learn to be assertive – ask for what you want. Express yourself – shouting and crying can be an effective short term solution. Reward yourself for any major or minor accomplishment. Change what you can control and accept what you cannot. Seek support from friends, family, counselors, advisors, and instructors. Do something for others instead of being preoccupied with your own needs. Remember: Implement stress tips one at a time. This is the most crucial rule. Get up at about the same time every day, especially on the morning after you’ve lost sleep. Sleeping late for just a couple of days can reset your body clock to a different cycle—you’ll be getting sleepy later and waking up later. Light helps restart your body clock to its active daytime phase. So when you get up, go outside and get some sunlight. Or if that’s difficult, turn on all the lights in your room. Then walk around a few minutes. The calves of your legs act as pumps and get blood circulating, carrying more oxygen to your brain to help get you going. Keep physically active during the day. This is especially important the day after a bad night’s sleep. Being less active is one of the worst things an insomniac can do. Strenuous exercise (brisk walking, swimming, jogging, squash, etc.) in late afternoon seems to promote more restful sleep. Also, insomniacs tend to be too inactive a couple of hours before bed. Do not take any naps the day after you’ve lost sleep. When you feel sleepy, get up and do something. Walk, make the bed, or do your errands. While studying, get up regularly (every 30 minutes, or more often if necessary) to walk around your room. Do a gentle stretch. That will increase the flow of oxygen to your brain and help you to be more alert. First, try to go to bed at the same time every night. Second, go to bed later when you are having trouble sleeping. Use the bed only for sleeping. Avoid bright lights at night. Avoid caffeine and other stimulants. Keep the same bedtime each night. Turn down the thermostat at night. Avoid taking your problems to bed. Replay scenes from a favorite movie. Take a walk in your mind’s eye. Talk things through with a trusted friend. Write down your ruminative thoughts. Fill your mind and thoughts with positive images. Don’t try to fall asleep. CLICK HERE FOR LINKS TO RELAXATION AND MINDFULNESS EXERCISES ON iTunes U! Most students experience some level of anxiety during an exam. However, when anxiety begins to affect exam performance it has become a problem. How friends and other students are doing. The negative consequence of failure. During an exam, as in any stressful situations, a student may experience any of the following bodily changes. Having difficulty reading and understanding the questions on the exam paper. Having difficulty retrieving key words and concepts when answering essay question. Doing poorly on an exam even though you know the material. Remembering the correct answers as soon as the exam is over. Ways to Overcome Test Anxiety! Learn and Use Effective Time Management and Study Skills. Preparing for exams starts well before the test date. Know the material and you then eliminate one of the most important causes of exam panics: uncertainty of preparation. 1. Avoid Cramming Before the Test. 2. Avoid Arriving Too Early for the Test. Panic is contagious and you can catch it from other students. 3. Continue your Daily Habits as Usual. Too much sleep or too little, changes in eating habits, attending a movie – any of these modify your physiological functioning so that you are “not yourself” during the examination. 4. Limit you Intake of Caffeine and Other Stimulants Before the Exam. Too much caffeine and other stimulants will increase your anxiety level and make it difficult to concentrate. 1. Identify what you are saying to yourself about test. Talking to yourself in a certain way before and during exams is what make you anxious in testing situations. 3. When you identify your own anxiety-arousing thoughts and worries, then question them. Are they logical, accurate, and/or realistic? 5. Praise Yourself. Talk to yourself in a positive way. 6. Think Pleasant Thoughts. For example, when you notice yourself worrying about an upcoming test, substitute your thoughts of doom with visions of something you like to do. 1. Learn and Practice Relaxation Techniques. 3. Focus/Mindfulness. Concentrate all your attention on one point or specific object. 4. Develop an Awareness of Tension. One method to increase awareness is to scan your body. Sit comfortably and close your eyes. Focus on the muscles in your feet and notice if they are relaxed. Tell those muscles can relax. Then repeat this procedure with the muscles up your legs, through your body and head, and down your arms. 5. Tense and Relax. This process involves tensing the muscles and then relaxing them. 6. Remember the Power of Imagery. Take a fantasy trip. Close your eyes and imagine yourself in a beautiful, peaceful, natural setting. 7. Exercise Aerobically. This is an excellent way to reduce stored tension. Identify Your Visualizations about Tests. When you are worrying and thinking anxiety-producing thoughts, you are literally seeing yourself fail. Visualize and Mentally Rehearse Success. You cannot do anything that you can’t first see yourself doing. So rehearse what it will be like to succeed. Sit up in a chair, arms and legs uncrossed. Close your eyes and let go of your thoughts. Focus on slowing your breathing and relaxing your body for a moments or two. Visualize Taking the Test Successfully. The Key is Detail. Review your summary sheets for an overall view do the material. Recite your own words. Get enough sleep. Avoid caffeine which increases anxiety. Remember to encourage yourself and STOP critical statements. Give yourself time to feel composed and to be on time for the exam. Avoid anxious classmates who are talking about the exam. Look over the entire test, READ THE DIRECTIONS, plan your approach, and schedule your time. Start with the easiest question first. Focus your attention on the test. Don’t waste time and energy worrying, thinking about the consequences of not doing well, or wondering what others are doing. Suggest to yourself that you probably studied it and the answer will come to you when you get back to it. If you start to feel anxious, practice your relaxation techniques. Use anxiety as a cue to relax. Close your eyes and take three deep breaths, then back to the task. Essay Exams: Organize your thoughts in a brief outline. Look for key words such as compare, contrast, describe, or identify. Start with a short summary or topical sentence and then make your points. Don’t ramble. Remember what the professor emphasized. Objective Exams: Think of your own answer before looking at the choices provided. Eliminate clearly wrong answers and make an educated guess (unless there is a severe penalty for wrong answers). After you have answered those you know, return to those you checked. Think about only one question at a time. After you have answered those you know, return to those you checked. If your time is running out, concentrate on those questions you know well and/or have the most weight. Use all the time allowed for reviewing your answers, completing ideas. Only change answers if you are sure of yourself. First, schedule your tasks for your project. Write down a list of the tasks you must undertake to complete your project. Set priorities among these. Mark each one off as you complete it… and reward yourself! Start with the most unpleasant task – to get it over with – work down until you get to the easier ones. Do something daily on your project, even if it only for 5 minutes. Write down two or three things you can do toward your task that you can accomplish in 5 minutes and then do one of them… and reward yourself! When it comes to do your task and you are tempted to procrastinate, make yourself sit down for 5 minutes and think about what you are about to do. Envision the emotional and physical consequences of procrastinating – and of following through on your plan to work. After you think this over, go ahead and do what you judge best… with no apologies or second thoughts! When you feel an impulse to work on your project, follow up on it. Do it at the moment you think of it and keep at it until you don’t feel like it anymore. Decide on a specific reward for success (i.e. “I get to go to the movies tonight if I finish this section of my project”) – and/or a punishment for failure (i.e. “I don’t get to go to the movies if I don’t finish this section of my project”) – at working on your task. Make it realistic and follow through. Anger. We are angry and often enraged at your partner or lover for shaking our world to its core. Hope. Initially we may fantasize that there will be reconciliation, that the parting is only temporary, and that our partner will come back to us. As we heal and accept the reality of the ending, we may dare to hope for a newer and better world for ourselves. While some of these feeling may seem overwhelming, they are all “normal” reactions and are necessary to the process of healing so that we can eventually move on and engage in other relationships. Loneliness does not necessarily mean being alone. For example, you can feel lonely when you are in class with 300 other students, in the middle of a party, or at a football game with hundreds of screaming fans. Loneliness is a painful awareness that you are not feeling connected to others and important needs are not being met. Unloved by those around you. There is no one with whom to share your personal concerns and experiences. That you are alone and have no other choice. You find it difficult to make friends and go beyond mere acquaintance. You experience low self-esteem. You depend on your classmates and friends to build your self-esteem and to initiate activities. You blame yourself and other students for your poor social relationships. You falsely assume that nobody likes you. You do not make any attempt to get involved in social activities. You expect everyone that you admire to like and include you in their activities and conversations. If they do not include you in the social activities you many become more withdrawn, angry and isolated from other activities. You become self-conscience and worry unnecessarily about being evaluated by your instructors, classmates and peers. You avoid meeting people and new situations. You perceive yourself in a negative way. You become overly critical of your physical appearance. You feel isolated, alone and unhappy about your situation. Seek out situations that enable you to get involved with other students. For example: someone in class to be your study partner. Get involved with class discussions. Get involved in organizations and activities on campus. Do some volunteer work. Helping others will boost your self-esteem and make you feel good about yourself. Don’t judge people on the basis of your past experiences. Give your instructors, classmates and peers a chance, and try to get to know them. Remember! There are individual differences in people. Learn to admire and accept their differences. When you are alone, use the time to enjoy yourself. For example, listen to music or watch a favorite television show. Do not spend the time eating endlessly or worrying about your problems. To flourish, an intimate relationship needs careful attention to good communication. Here are some direct steps to improve communication. Set aside a special time to talk about each other and your relationship. It is important to talk on a regular basis without distractions. Try setting aside 10-15 minutes daily to check in with each other. Listen to your partner by giving your fill attention and contemplating what he or she has said before responding. Remember: the goal is to UNDERSTAND your partner, not necessarily agree. Never assume what your partner is thinking. Trying to read minds is dangerous to all relationships. Ask for feedback. Check out your assumptions. Never assume that your partner knows what you want, think, or feel. Assumptions like this often lead to disappointment or unnecessary frustration. When discussing a matter on which you disagree, it is important to get a good grasp on your partner’s feelings and perceptions before advancing your own position. Communicate honestly your concerns about your relationship, but avoid accusing or blaming statements. If you feel under attack or find yourself discussing past hurts, you and your partner are probably off track and not listening to each other. Slow down and try to understand each other’s experience and positions on the particular concern being discussed. Be clear about your needs and priorities without being either inflexible or feeling like you must always give in. Do things regularly that you know your partner appreciates and will show your partner that you care about him or her. Be positive in your communication with your partner. Let him or her hear frequently about things you appreciate. Include humor or playfulness in your routine. Surprises and humor are wonderful icebreakers if tension has developed between you. Touch as much as you are comfortable with, as this nonverbally communicates caring and support. Touching each other when one of you is upset can help dissolve tension and make talking about an issue feel safer. Get help from a counselor if you find yourself feeling angry, bitter, resentful, or discourages in relation to your partner over an extended period.